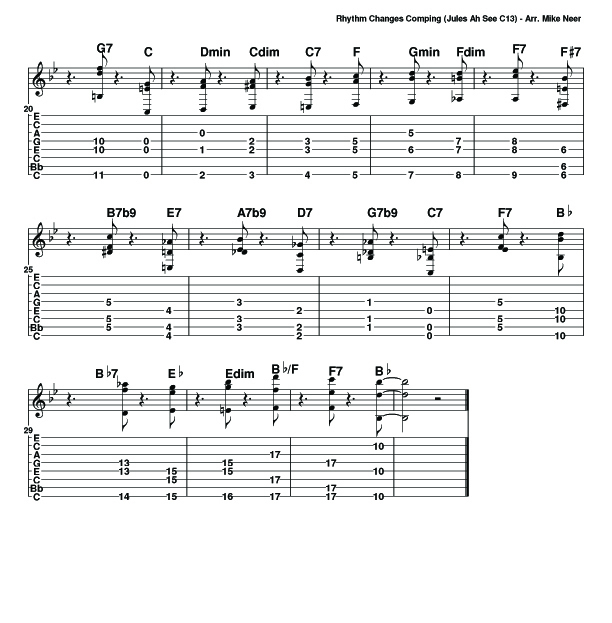 One of the distinct beauties and advantages of the Jules Ah See C13 tuning, which I use almost exclusively, is the availability of options for playing chord changes in a jazz guitar style. To clarify a bit further, comping chords in Jazz very often involves chord voicings which are abbreviated by leaving out several unnecessary chord tones, but using just enough to imply the intended harmony. In this approach we begin to understand the similarities between many of the chords we’re playing and often substitute one for another, enabling us to stay in position and avoid having to jump up and down the neck for each chord change. The low C string (string 8) was brilliantly added to the tuning and really establishes a great uniqueness in its ability to deal with bass notes, which are most often avoided on steel guitar–but then again, so is chord comping, so we’re really exploring fresh territory here. In musical situations including a bass player, we would be wise to avoid using too many bass notes and walking bass patterns. But getting these changes under your bar will prove very useful in other situations, such as duos. What I have notated and tabbed below is essentially the chord changes to the composition I Got Rhythm by George and Ira Gershwin (frequently called ‘Rhythm Changes’ by Jazz musicians). This, along with the Blues are two of the essential song formats for Jazz and knowledge and mastery of them is crucial. In the example I have provided, you will see that there are many chord changes that fall outside of the song’s usual substituted harmony, which is essentially (A) I vi ii V7, I vi ii V7, I I7 IV #IVdim V7 I, (B) III7 VI7 II7 V7, and then repeat (A) section. In my example, the first A section is straightforward, the second A section touches on a few substitutions from Coltrane changes, and the third A section uses a substitution often employed by Thelonious Monk: a descending cycle of chromatic dominant 7th chords beginning on the bVI (Gb). Most of these chords are very easy to play in this tuning. An important task is getting good accuracy with the right hand, which comes with lots of practice, but it does come, I promise. Another important element is slanting. In this example you’ll see many unusual slants, such as the min9 chords in measures 6 and 8, but they can be played and played in tune. 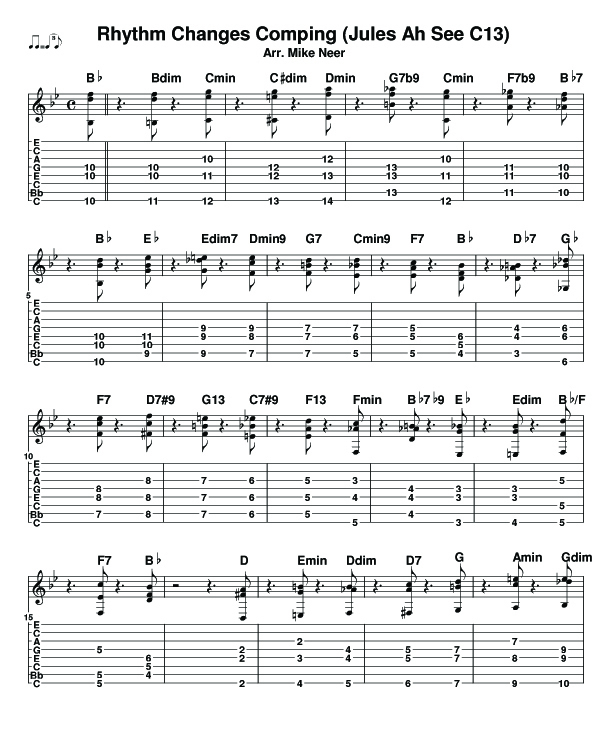 I do notice that it is a little easier to play many of these slant voicings in tune on my steels with tighter string spacing, but I can still manage on my other guitars with wider spacing. The fact that these chords do not ring out is also an important key to the sound. The sound should just be nice, clear stabs that are in tune. See the video below for an example.